Summer’s here! This is a lot of people’s favorite season for a reason, although the increased heat can be difficult on lymphies. Before you go out into the sun, it’s important to keep in mind that people with lymphedema are more susceptible to risks brought on by the heat. Have no fear, though! There are things you can do to beat the heat and still enjoy your summertime. When indoors, try to stay where it’s well air-conditioned. The hottest parts of the day are between 11 am and 3 pm – try to limit your time outside during these hours! If you get overheated, elevate your affected limb and place a cold, wet towel over it. Drink plenty of water! Staying well hydrated makes it easier for your body to regulate its temperature. Wear light, loose, non-constricting clothing. This creates better lymphatic flow, as well as keeping you cooler! Powder the inside of your shoes with an unscented bath powder or anti-fungal powder to help prevent fungal infections. Get measured for a garment after the hot weather starts, and again after it has ended. This way, your garments will be better fitted to the seasonal changes your edema goes through. Clean your garment regularly to avoid deterioration from sweat, body oils, and sunscreen! Apply insect repellent before going outside. Avoid using ones with DEET, however. You can do this by purchasing natural repellents from health food stores. Treat insect bites immediately to avoid increased swelling or itching in that area. Wash and dry the area completely before applying antibiotic cream or ointment. If you’re going camping, bring along a specialized first aid kit that includes alcohol wipes to clean any skin breaks, antibiotic cream, and bandages. If you are prone to cellulitis or infections, you may want to ask your doctor for antibiotics to bring along, just in case your limb becomes infected while you are away from home. If traveling by car, use air conditioning so you don’t overheat. If traveling by car and your arm is affected, do not drive for long periods of time. If traveling by bus or car, be sure to get off at each rest stop to walk around. Do frequent in-seat exercises to keep the fluid moving! Click here to read more travel tips. Avoid excessive sun exposure, as sunburn will place an extra burden on your lymphatic system. Remember that even if you are wearing a compression garment, it is still possible to get sunburn. Be sure to wear sunscreen when going outside! Chlorine can be drying to your skin. You can combat this by applying a moisture barrier cream before getting into the water, as well as after you get out of the pool. Avoid a fungal infection by wearing footwear at all times when you aren’t in the pool, especially in the shower area! When swimming in a natural body of water, wear water shoes to avoid cutting your feet on shells or stones. If you have a skin break on your affected limb, it’s best not to go into the water. While swimming, you can wear an old compression garment or none at all – just be sure to don some form of compression once you get out! Take a bath or shower after swimming, and be sure to dry off completely afterward. The combination of heat and physical activity can put a lot of stress on your affected limb, so be sure to pace yourself. Play for shorter periods of time, taking breaks at regular intervals. As soon as your affected limb feels uncomfortable, stop and take a break. Elevate the limb until your symptoms subside. I know that summer can be daunting because it seems like everyone is out there living it up while you’re sitting on the sofa with your leg propped up – at least, that’s what I’ve been doing – but you cannot let your lymphedema get in the way of enjoying your life! With a little mindfulness and care, you can still do the things that you enjoy. 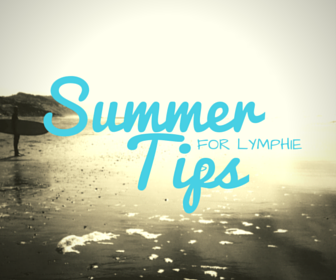 Have a great summer, lymphies, and please submit any tips or stories of your own in the comments section below! Tips provided by an article from the National Lymphedema Network. Excellent tips! Really like the staying cool tips. Everyone deserves to enjoy summer. I am reading your blog for the first time and am so happy to find someone to discuss my lymphadema with. I was diagnosed with Ovarian cancer and 1 year from today I had surgery. I went through chemotherapy and approx 3 mos post op I noticed my upper right thigh was swollen. The doctor indicated it was probably lymphedema. I went to to a lymphdema therapist and had MLD, and now I use Flexi touch compression pump, and stockings. So this is my first summer experience. My lymphadema is minor according to my doctor but to me I still have it and need to deal with it. I asked him if I could occasionally go a day without stockings and if my leg got a bit swollen then the pump and stockings would rectify it over the next week. Do you ever go a day with out the stocking? Do you think I am risking causing a lot of damage? Does your leg sometime feel tingling? All responses appreciated So glad I found this blog!! My Lymphedema therapist told me about Lymphie Life. I “celebrated” my one year ovarian cancer survival on July 1st, the date of my surgery. My story is very similar to you – noticed a strangeness in my right thigh after the chemotherapy ended. Because I had a second surgery to revise the poorly healed abdominal scar (that’s another nightmare consequence of the cancer surgery! Infection followed by 5 months of healing from the inside out), custom compression garments weren’t ordered until a month ago. Don’t have them yet. I have been wearing compression pantyhose and leggings. What do you think of the FlexiTouch pump – is it helping? This Lymphedema has been harder to accept, emotionally, than the cancer and chemotherapy. We have a sailboat and are back out sailing for a couple weeks right now. The Lymphedema has taken some of the joy out of it. I miss being bare legged and wearing shorts.